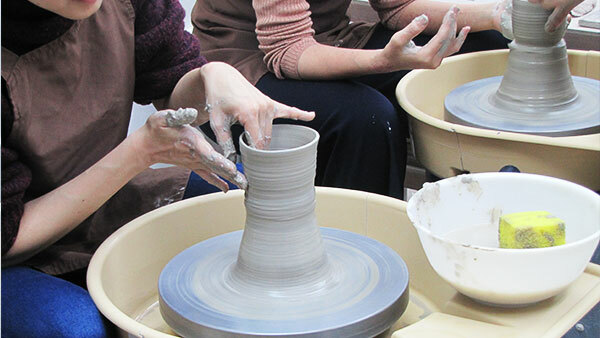 Uzumako offers fun ceramic and pottery lessons in a relaxed environment, in both Japanese and English. We teach Japanese techniques for wheel throwing, hand-building, glazing, and firing. Students are also exposed to a variety of tools and materials. Our instructors are professional potters who graduated from prestigious art schools in Japan and have their own artistic careers. We have a open registration system so you can start anytime. 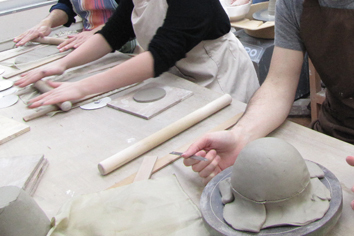 English pottery classes are available every Tuesday, Thursday, Saturday, and Sunday. Please let us know if you prefer to be taught in English. Note that class times are flexible – you don’t have to follow a fixed schedule every week. There are three instructors who can teach in English. Shipping is available for overseas customers. We use the Japanese international EMS posting service. The monthly fee is payable at the beginning of each course and we accept Japanese Yen and VISA, MasterCard and American Express credit cards. Rescheduling classes is permitted if time slots are available. Please take the number of classes you have registered and paid for per month as we do not refund money paid for the classes that have not been taken. We provide all materials (including tools, clay and aprons) so you do not need to bring anything to class. Feel free to bring your own tools and aprons but please take your belongings home after each lesson as we do not have locker facilities for you to store your belongings. Learning to use the potter’s wheel takes patience, practice and focus. It is also super-relaxing and rewarding. If you are a total beginner, we will sit with you for an hour or two of lessons for your first few visits. After that, people typically find their feet a bit and want to work on their own with occasional advice, troubleshooting, demonstrations of new forms, or rescue missions. There are two instructors here who can help you as much as you want. You’ll make a few wobbly small bowls, plates or cups on your first couple of visits, but as you get better control you will begin to create your favorite forms. For intermediate and advanced potters, we’re here when you need us for technical advice, aesthetic opinions, or learning new forms. We also aren’t shy with challenging you to explore new directions like altering forms, advanced surface treatments, construction of more complex works, etc. Hand-building, or sculpture, is the other way of working with clay. The basic techniques are easier to learn and the range of forms you can produce is much broader. If you are interested in clay, but aren’t sure the wheel is for you, think about hand-building. For the beginner, you will be surprised how easy it is to begin making nice functional ware or artworks on your very first day in less than 30 minutes!